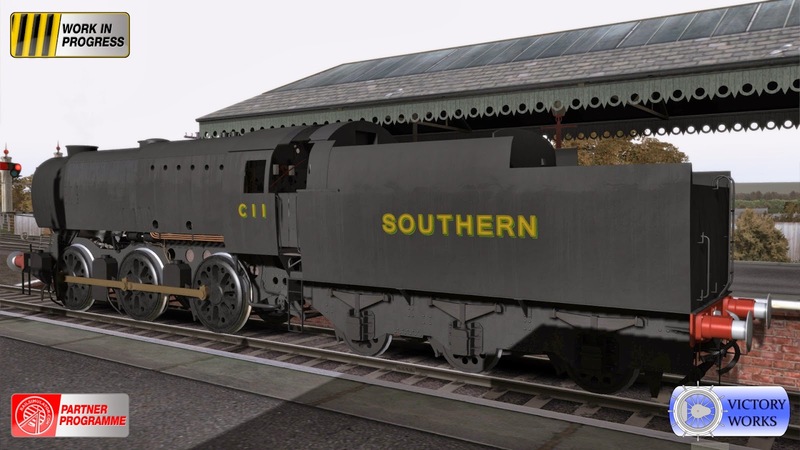 It's time to see the Q1 in possibly it's most famous livery - a light coat of BR paint covered in official southern British dirt and neglect, finished off with some priming residue and a lot of misplaced oil. 33017, fitted with the unusual dual mechanical lubricator, starting the days work still wearing it's pre-1956 logo on the tender but this could be almost any time as repainting these work horses was never a priority. And 33001 at the end of a day's shift in 1961, showing an H head code it's heading back to Feltham yard to be cleaned out before starting another day of heavy freight duty. As promised, here are a couple of pictures of the "clean" BR version of the Q1. 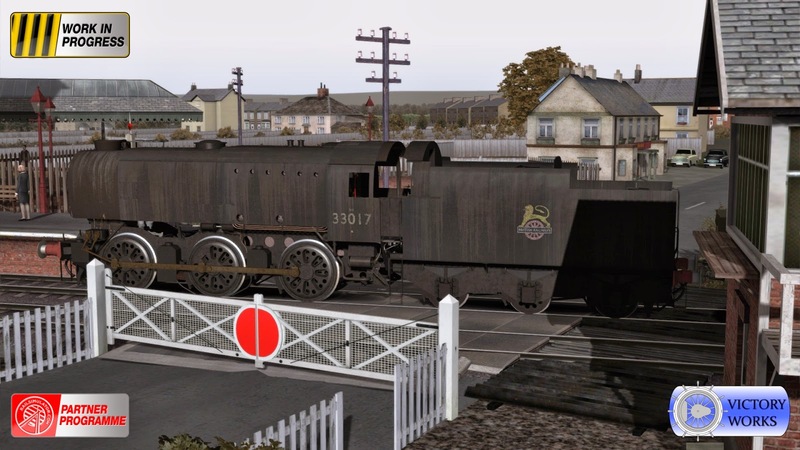 Firstly 33029, pulling an early logo BR tender, is fitted with a mechanical lubricator, AWS and with overhead warning flashes on the front sandboxes and also (unseen in this picture) on the rear of the tender next to the ladder. 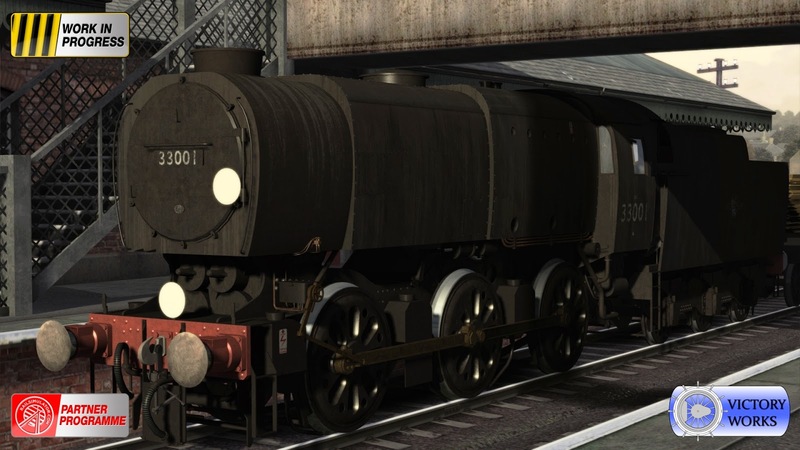 All of the options for the locos are set up "out of the box" for each number, however if you want to have a set up of your own then it can be easily changed using the loco number in any scenario they are placed in. The warning flashes are automatically set on the tender if the loco attached to them has them, so everything can be set from the loco itself. Secondly we have a picture of 33024, with a late crest BR logo on it's tender, leaving the yard ready for some heavy freight duties. 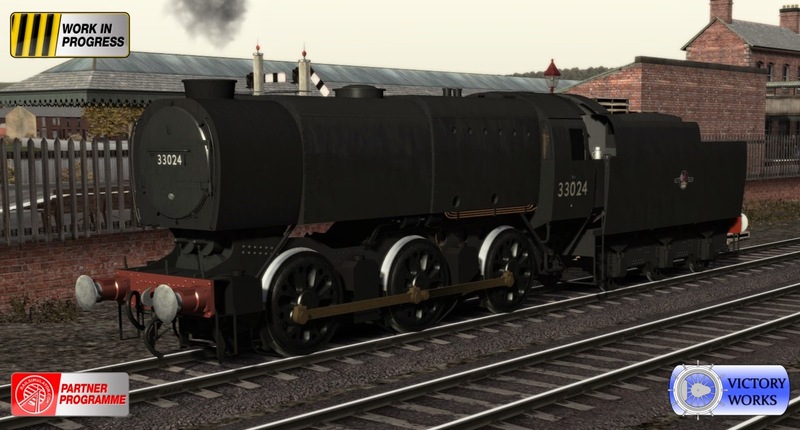 Unlike 33029, this loco is very bare bones and has no AWS and a hydrostatic lubricator - it doesn't even have cab windows! In a day or 2 we'll move onto pictures of some filth.. 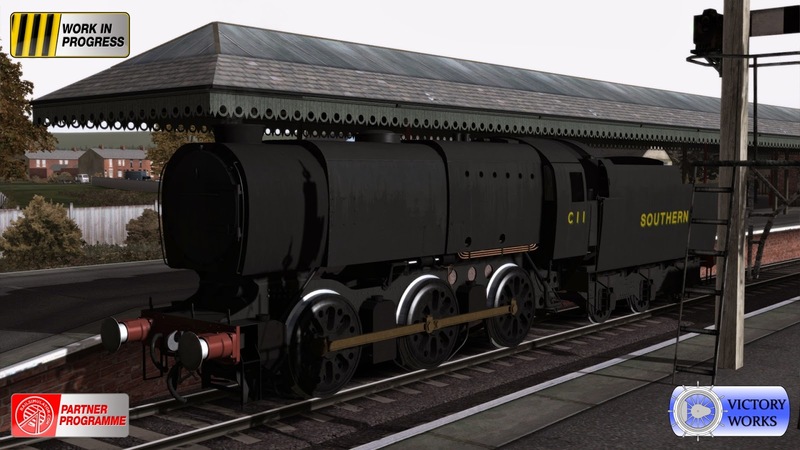 I'm talking dirty steam locos of course! 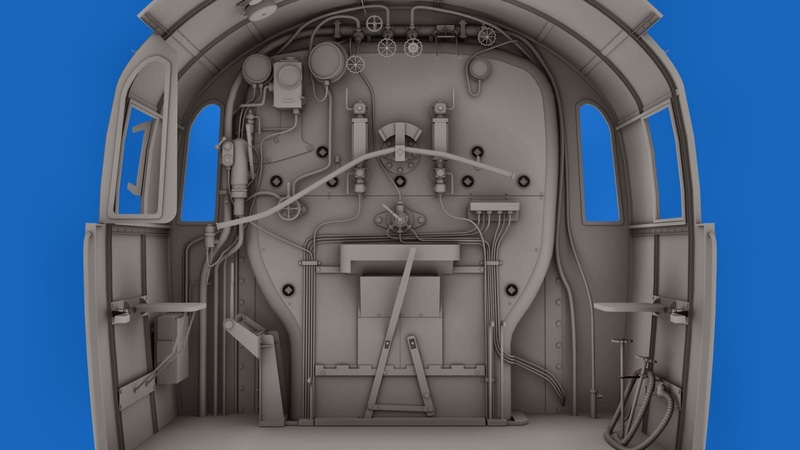 So things are going well with the unwrapping and texturing of the Q1 and over the next few days I'm going to be posting pictures of the various liveries, the cab and tender, and later the accompanying stock as well. So working in a historical manner, we're kicking off with the original Southern livery from 1942. C11 is seen here, fitted with the hydrostatic lubricator and therefore lacking the mechanical lubricator and arm normally seen on and above the left-hand front wheel. C1 to C28 were built with these, C29 to C40 being built later and having the mechanical lubricator "factory fitted". Next time it'll be the British Railways "clean" version, with their various modifications, and covering both pre and post 1956 logos. The cab and all control animations are now complete and after some unwrapping over the next few days it'll be time for textures. So you can expect the next pictures to be in glorious technicolour! I am however taking tomorrow off to head to my "local", the Mid Hants/Watercress Line for their Spring Steam Gala - I can't believe it's been over a year since I saw a running steam loco! Bulleid Q1: Need a cab? The cab is modelled, and to borrow a quote from Neo in the Matrix - "I need pipes.. lots of pipes!" This picture shows the version with AWS, mechanical lubricator/s, windows and side protectors. The hydrostatic lubricator also needs to be built and "plumbed in". I've also returned to the wheel slip script this morning and after some time away and a fresh set of eyes have made another significant step with incorporating it with the steam chest script. I won't list the technical stuff but the upshot of it is that after some trial and error with driving I found the best way to get moving is to pump the regulator. Which is a bit of luck, as that's how the real things work! 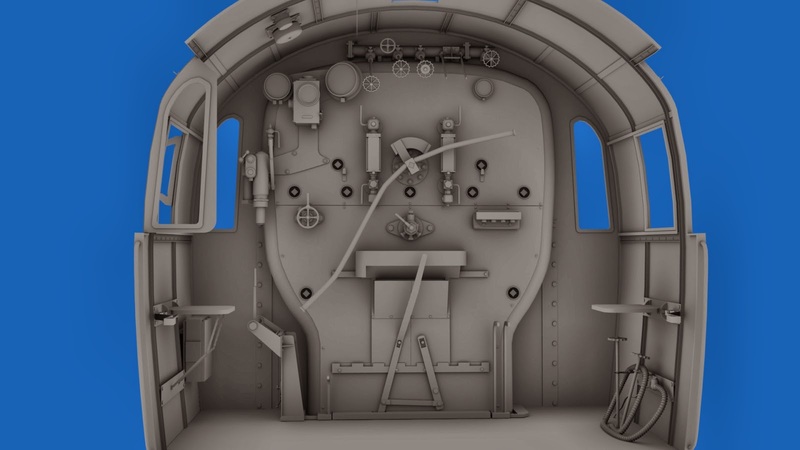 I can't wait to get the loco model finished, unwrapped and textured so I can make a video to show it in action!